A few days after the release of Madiha Noman New winter collection 2013, the brand launched Madiha Noman casual dresses 2013 were launched. They were launched today. These dresses belong to a collection known as frill fever. 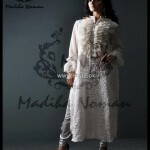 All of Madiha Noman casual dresses 2013 are white in color. Long shirts with churidaars are included in each dress in this new collection of dresses by Madiha Noman. You can see the frills on the neckline of the shirts in these dresses. Overall, Madiha Noman casual dresses 2013 for women are stylish and some of them can be worn for parties also. Madiha Noman is a talented designer who started fashion designing many years ago. The name of her brand in M&N Fashions. Madiha Noman currently designs outfits for women only. Many different kinds of stylish dresses are provided by Madiha Noman. Bridal, casual, formal and semi-formal wear outfits are provided by Madiha Noman. Madiha Noman has a prêt wear and couture wear line also. 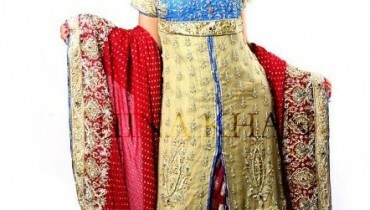 You can see a fusion of different cultures in the dresses of Madiha Noman. Her outfits can be seen in television shows, on ramps, fashion magazines and multi-brand stores in Pakistan. Her prêt line is available multi-brand stores. The team of Madiha Noman can be contacted through email and phone. Madiha Noman casual dresses 2013 for women can be seen below. The pictures from the photo shoot of this collection are below. You can get these dresses from Multi-brand stores. If you have any questions about Madiha Noman casual dresses 2013 for women, you can contact the team through email, phone or Facebook. 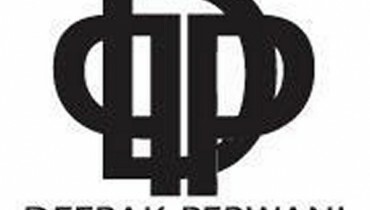 The address of the Facebook page, which will provide you with the contact details of the designer and her brand and interact with her team, is given below for your convenience.